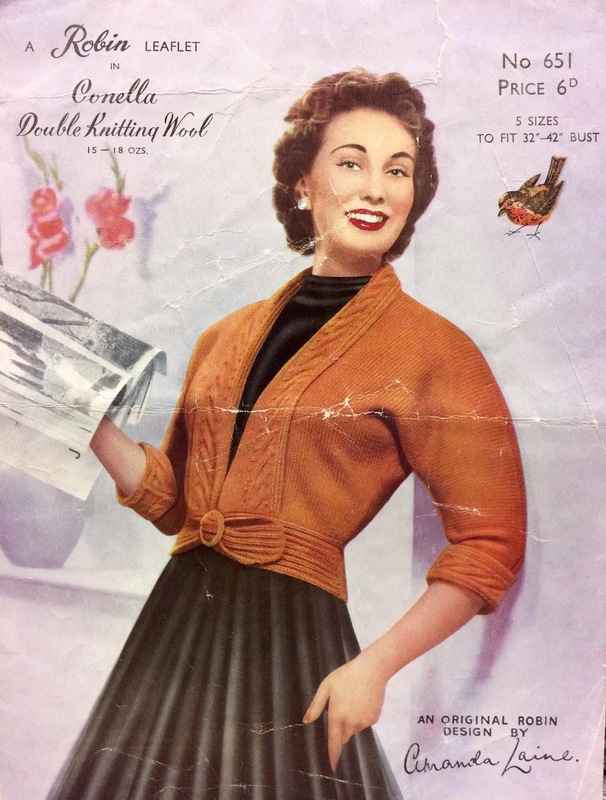 I have recently been looking through my knitting pattern collection, (one of my favourite pastimes! ), and I have come up with a wish list of makes for this year. It is very much a wish list, not a plan or a schedule, for several reasons. Given that it is already the end of January it is highly unlikely that I could make all 12 garments this year, even if I knitted like the wind and didn't knit anything for anyone else, commissions, presents etc. Secondly, whilst my neck and shoulder have improved and keep on doing so I still can't knit as much as I would like to do. Sadly. I want to do all the knitting!! All the time! Finally, I know a plan would make me feel under pressure, which my head wouldn't deal with at all well and I would feel like a failure if I didn't do everything. So for me, that is best avoided and instead I will go to these patterns first when I want to start a new project and hopefully complete at least a couple of them this year. Let's look at the patterns! I love this twinset. Love her make up too. 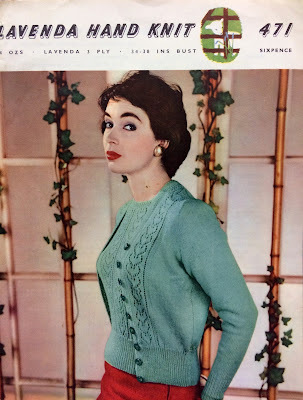 In fact I'm hoping that her look will transfer itself to me if I knit the garments. It is hard to see but the heart panels cover the front of the jumper too. I don't know if I would make both items to wear together as I'm not sure it is ever really cold enough here for that but I can see both working well in my wardrobe and a twinset has been a long held wish of mine. The pattern states 'Collar - NEW; Buttoning - New; Back - NEW' making it very clear that this was a really up to the minute make. I do indeed like the collar and the button positioning and the back has a kind of vent in it which looks good and would be interesting to knit. I do have the yarn lined up for this one, it was a Christmas present and is two shades of Fyberspates Scrumptious 4ply in a rich deep purple and dark grey. This is quite near the top of the making list. This is such a lovely image and I'm impressed that she looks so glamorous when she is poorly enough to be in bed and need a house call from the doctor. I do like a bed jacket pattern and I would really like to make one. 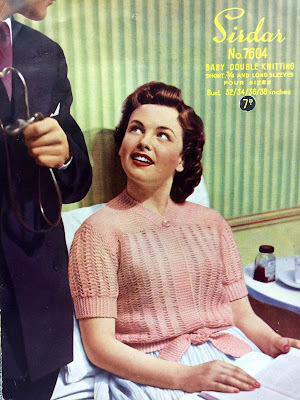 Whilst I am not adverse to wearing a bed jacket to lounge about at home and for reading in bed I would also be totally happy to wear this one out and about over a summer frock. It seems a shame to restrict the wear of good knitwear! Apparently this jumper can be knitted in 12 hours. I'm not sure I believe that. I knit at a reasonable speed but I think you would have to be properly speedy to achieve that. However, I am intrigued to know how long it would take me and it is a neat little jumper so maybe I will give it a go. I really want a sleeveless pullover and have many pullover patterns that I really like. I'm not sure why I want one so much as I never wear blouses but I'm sure other tops would work just as well. Hopefully. I have the yarn for this one too, it is Fyberspates again, in gold and slate (hello grellow!) and I bought it at Yarndale last September. This 1930's pattern was a surprise find, it was tucked inside some other patterns I bought and I didn't know it was there until I got it home. Many knitters seem to dislike knitting rib but I actually really, really like it, I find it ever so soothing to my head to do so a whole jumper in rib is very much a 'good thing' in my book. Plus, I like the collar and the fit so this is definitely a winner. It is a bit wrinkled and folded but I really like this pattern cover, as well as really liking the jacket. I like the interesting buckled fastening and waist detail and the shawl collar patterning which is repeated on the cuffs. I think it is super stylish and it looks great over a full skirt as we can see. 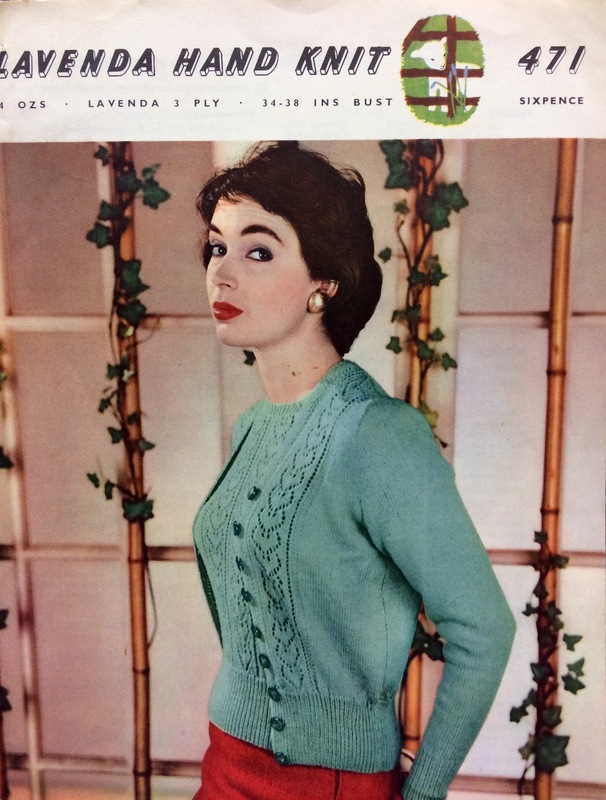 I have been hankering after a Tyrolean style cardigan for some time and this is one of the loveliest patterns in that style that I have found. 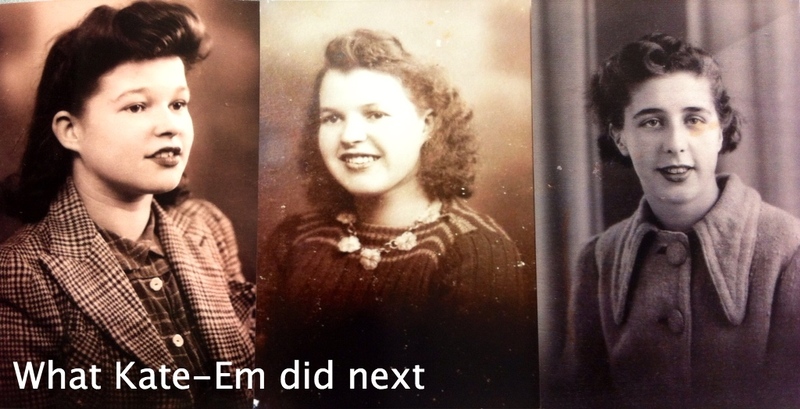 There are plenty to choose from as this style was very popular for a period. 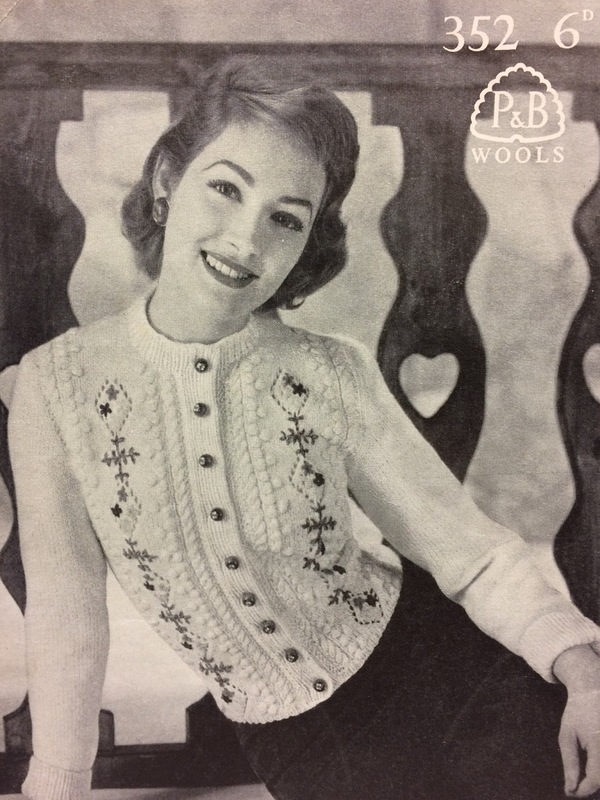 This cardigan has the pattern panel repeated up the centre back too which is a really pretty touch. It would take a lot of knitting and embroidering but it would definitely be worth it. 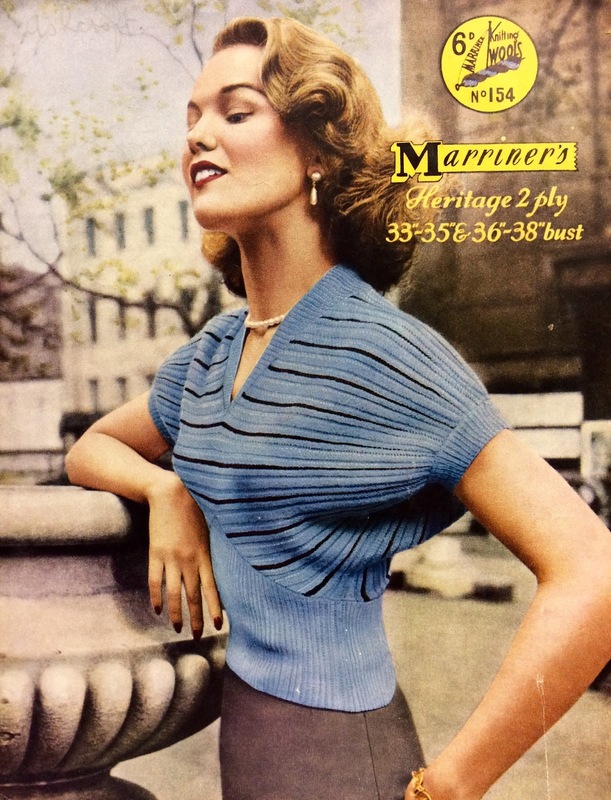 This just amazes me and ticks so many boxes - the v shaped deep rib, the stripes, the v neck, the dolman sleeves. It is gorgeous. 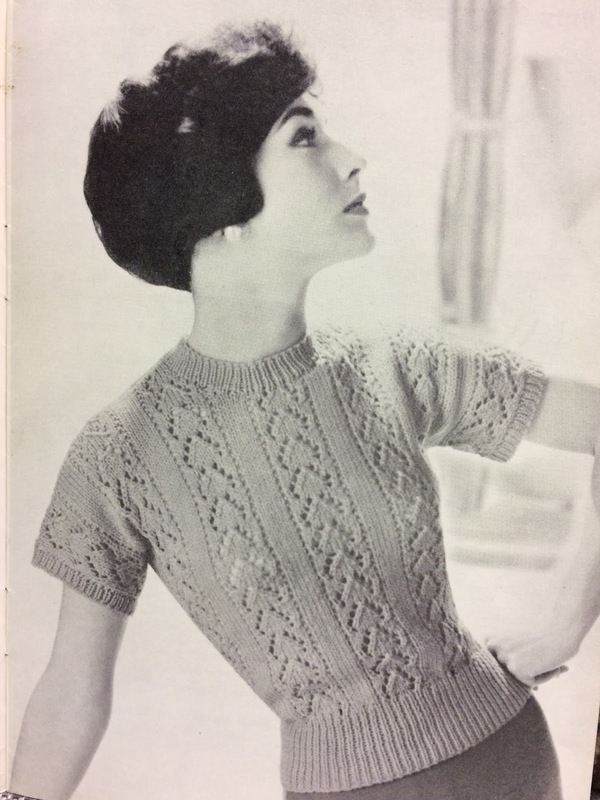 It is also knitted in 2 ply which is super fine so in knitting maths fine wool plus thin needles equals a long time until your jumper is ready to wear. But, I love it. So it is a definitely maybe project. Here is another speed knit. Again I'm not convinced. But I am intrigued and I like it lots and it would work well in my wardrobe and if it did only take 5 hours I could have one in every colour so, actually, yep, better give it a go. This is a 'Lady's Lumberjacket' and it is a beauty. The fit is great, those sleeves and that big ribbed welt. I like the colour work and the collar. I have yet to knit anything that needs a zip sewing into it so that would be a new skill to learn. Plus who doesn't want to be a lumberjack when they look this glamorous? Perfect red nail varnish and tree chopping?! No problem. In the interests of full disclosure I have helped to chop down some trees and have swung an axe before. I did not do it in wonderful knitwear, with coiffured hair or in nail varnish. I feel I maybe need to up my game. 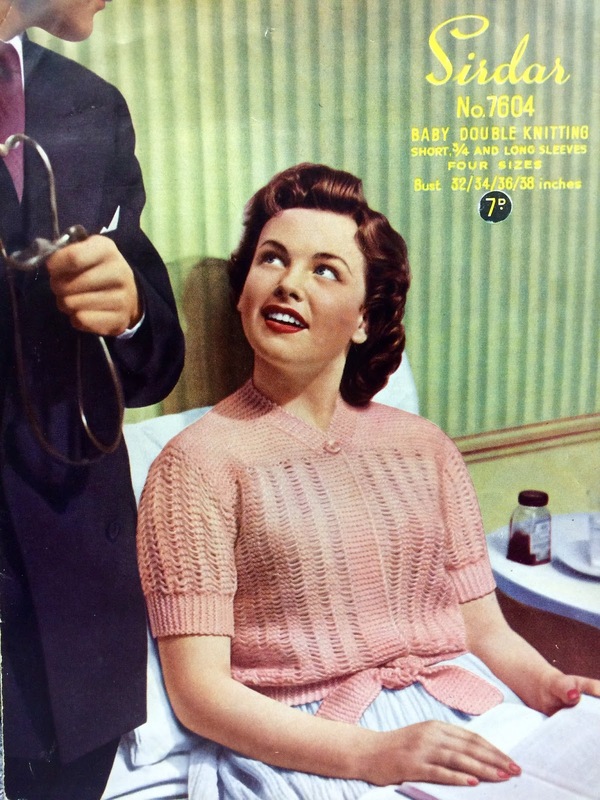 It is hard to see the details of this 'smart sweater' from 1954. 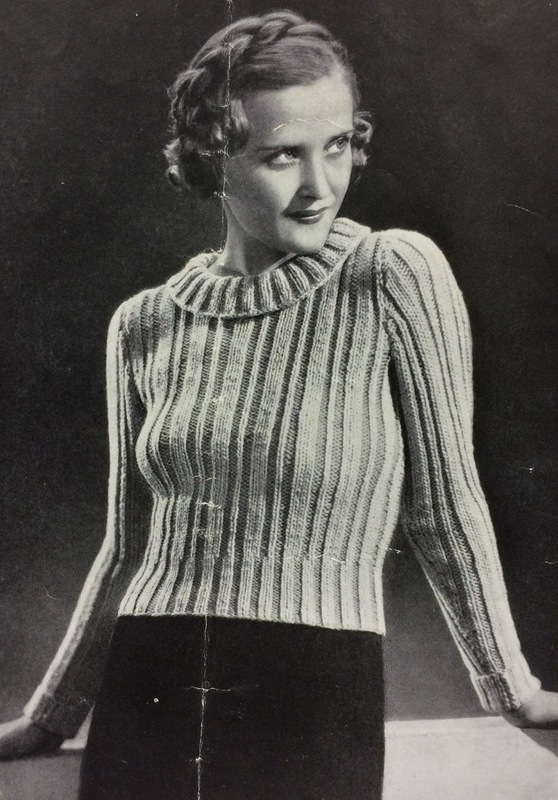 The bottom black half is all knitted in rib (yay) with this fabulous colour work top half. The original is done in monochrome which I like and I also think it could look very pretty in other colour combinations. Choices! So, will I make any of them this year? All of them? None of them? Who knows? I will report back and in the meantime I will be leaving the patterns, needles and yarn lying about in case any Elves and the Shoemaker type situations should occur. Thank you so much Liz. The 'mad skills' bit made me giggle! Thank you Rachel. Looking forward to seeing what you make this year. It is a great one. Would you wear it as a bed jacket or out and about? Love that dolman sleeve sweater! I'm a big fan of short sleeve sweaters in general, and that's such an usual and dramatic shape. 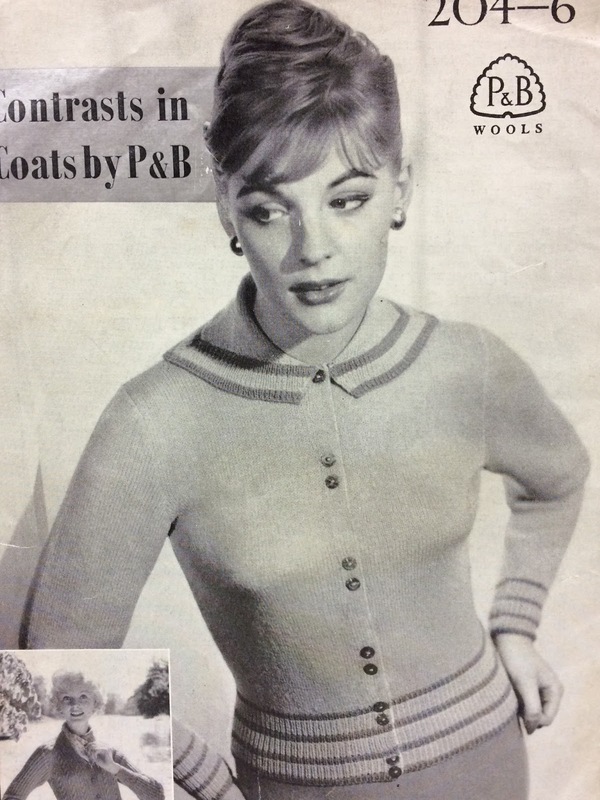 Dolman sleeves do produce a great shape don't they?! Short sleeved jumpers are so versatile. That heart-panel twin set is made of win - twin sets are so versatile. Great phrase! It is a goody! I can't choose a favourite either! The orange one is a delight though. All of these patterns are so pretty! I especially like the "12 hour" sweater, even if it can't live up to it's speedy promises. My mum and I are going to time ourselves on these speed knits and see how far we can get in the allotted time! 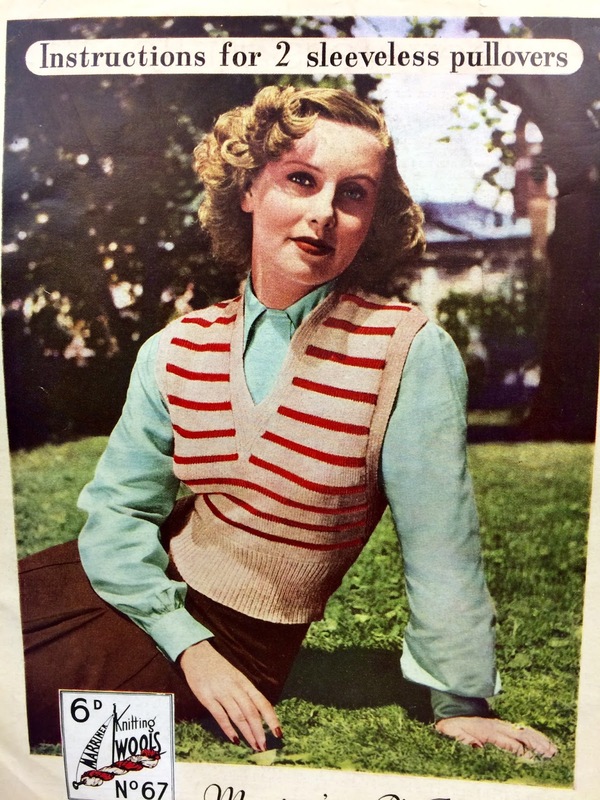 As I don't have any 1930's knitwear that jumper is an attractive choice. I found some yarn on sale that would work well for the bed jacket so unsurprisingly I bought it! I love the orange one with the buckle, that's a really cool detail. And I could do with some of these elves too. I leave my unfinished sewing around and all I get is a messy house. Damn those elves. Where are they when you need them?